With the adoption of Common Core State Standards, my job has become more valuable. This year in Common Core states, our content-area teachers in grades 6-12 must teach Common Core Literacy Standars with their academic standards. Some are taking this in stride, realizing that they have already been doing it. Others are panicking by yet another stipulation applied from the state. As I have been reading professional literature, attending conferences, and passing on new information to our secondary teachers, I am seeing the direct link between literacy and technology in the classroom. Here is a specific example. Just today our technology director came into my office to share two new sites he had stumbled upon. The first one he took me to is http://www.teachingchannel.org. It has an abundance of educational videos related to any subject, any grade. Some are short clips to actually show in your classroom, whereas others are short clips for professional development. I watched one under “science” on the use of word clouds. This 8th grade science teacher copies and pastes text that he will be using with his students into a site that creates word clouds. The site sorts the words according to times of use within the text and creates a cloud with words in various text sizes depending on importance. 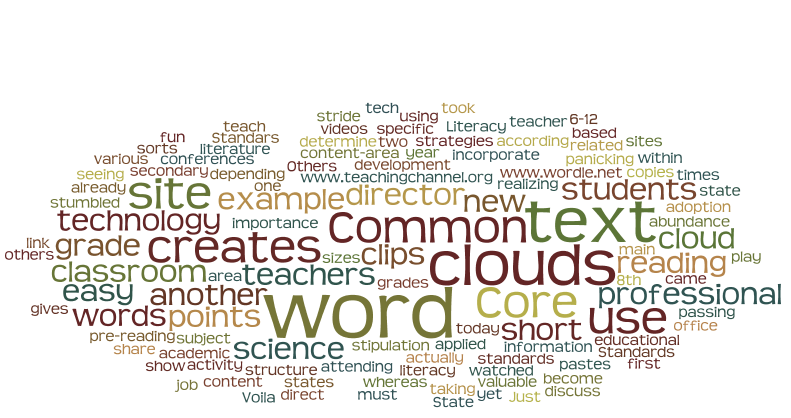 He gives these word clouds to students as a pre-reading activity. They have to discuss and determine what the main points in the text will be, based on the structure of the word cloud. Then, our tech director points me to http://www.wordle.net. Voila! The site that creates said word clouds. So easy to use, and fun to play with. Here is another example of how easy it is to incorporate reading strategies into any content area. Here is my word cloud for this article. Enjoy!